Tim's Miniature Wargaming Blog: More English Pike! I finished up a second unit of English pike for The Pikeman’s Lament over the weekend. As with the recently painted English pike in red four of these were painted almost a year and a half ago, but I replaced their original pikes and repainted helmets and one of the buffcoats. 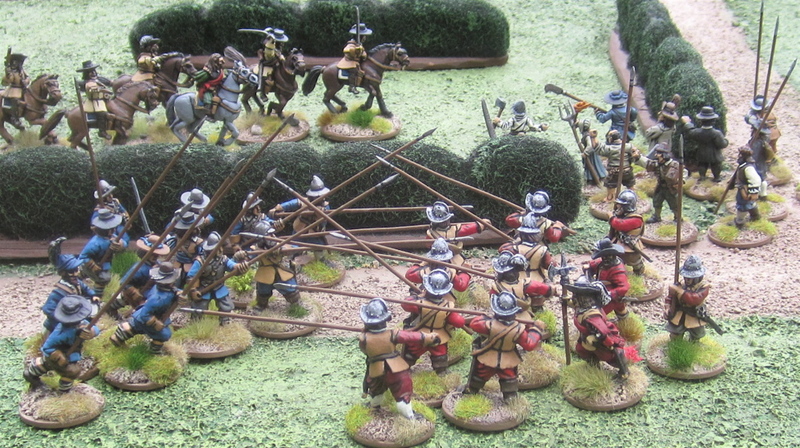 A unit of Pike for The Pikeman’s Lament. Most of the figures are from Old Glory Miniatures, but there are three in there from Warlord Games as well. A GAME?! Maybe?! There’s trouble a-brewing in the highlands! I have more highlanders on the workbench at the moment, and I’m just finishing up another batch of ECW Irish – which are going on a multi-figure base for my Scots Royalist DBA-X army. 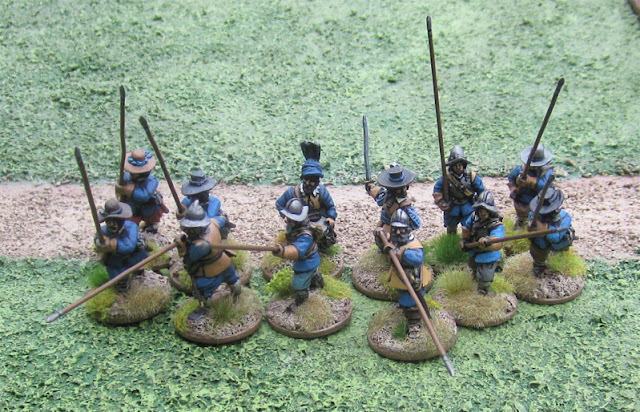 More nice pikemen, Tim! I agree about your stance on pike on the gaming table. Figures at push of pike cause more trouble than they are worth when going into melee. I try to avoid that pose although I do have a unit or two in that position. Very difficult to bring into battle. For skirmishing gaming with single figures, I could see that it would present a lesser problem. Controversially, I like the levelled pikes look, I've just lengthened the base to compensate, another nice looking regiment. Oh, I like the LOOK of them, for sure... but they present some challenges in terms of practicality for wargaming purposes. If the depth of your base does not matter, I suppose having really deep bases could take care of that... Do your musketeers then also have extra deep bases to match? Sorry Siggian... I accidentally deleted your post... I hate that the delete and publish links are right next to each other in my notification emails!? I think this is the third time I've done this this year!? GAH!? Actually I thought I HAD clicked on publish but then the screen popped up saying "Comment Deleted" and I screamed at the computer!